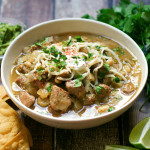 Tender chunks of pork simmered in a rich yet tangy tomatillo broth, a generous topping of luxurious sour cream and melty monterey jack cheese, a fresh pop of cilantro, and bright acidic squeeze of fresh lime juice. 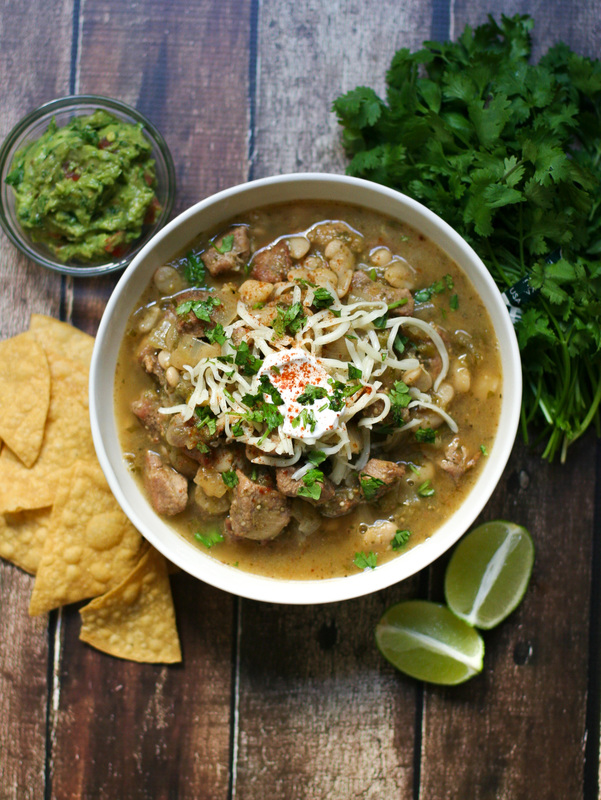 That’s pork chile verde. And it’s what dreams are made of. 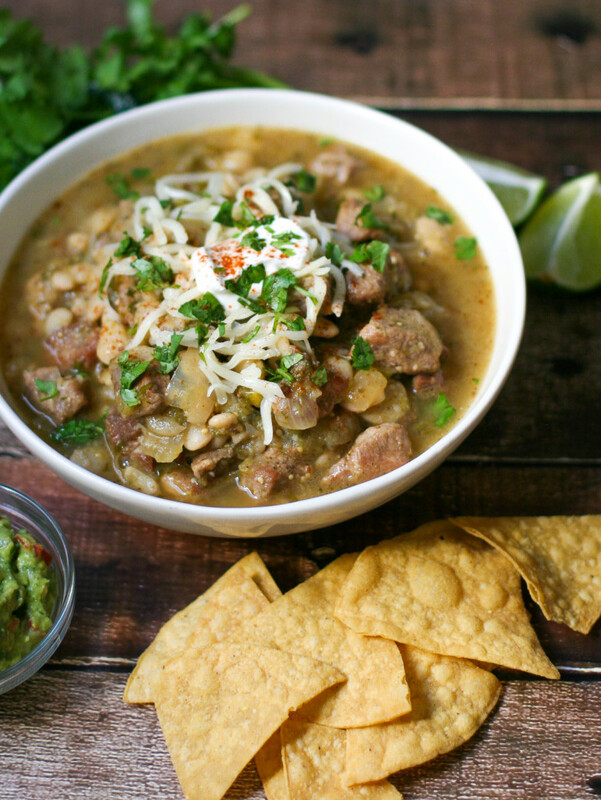 Chile verde is one of those awesome one-pot meals. It doesn’t leave many dirty dishes, and can feed a crowd with minimal effort. To make my chile verde more of a balanced meal, I like to stir in some pre-cooked lima beans (also known as butter beans) right at the end of the cook time. 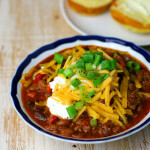 They thicken the chile, add a rich creamy texture to each bite, and contain soluble fiber that is great for lowering cholesterol & keeping your gut running smoothly. But seriously, meals like this are perfect for the start of football season (which is NOW, if you’re like our household & celebrate even preseason games). You can put on a pot in the early afternoon, enjoy some appetizers & beer, and have everyone serve themselves when they’re ready. Easy peasy. You don’t have to worry about over cooking anything, the pork will just continue to get more tender as it braises. Liberally season the cubed pork with salt and pepper. Heat the oil in a large dutch oven over high heat until shimmering. Add the pork and cook for about 15 minutes, stirring occasionally, until well browned on all sides. Remove with a slotted spoon and set aside. In the same pot, reduce the heat to medium, add the onion and jalapeno. Saute for 5 minutes until the onions are just starting to get soft but not yet browning. 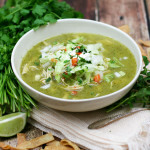 Add the tomatillo puree, oregano, cumin, half of the cilantro, and the chicken broth. Stir to combine. Add the pork back to the pot and bring to a boil. Reduce the heat to low, cover, and simmer for 60 minutes. After about 30 minutes, preheat the oven to 400 degrees. When there is about 15 minutes left for the soup to simmer, wrap the stack of tortillas in foil and place in the oven to warm. After the soup has simmered for 60 minutes, add the beans and simmer for 5 more minutes until heated through. 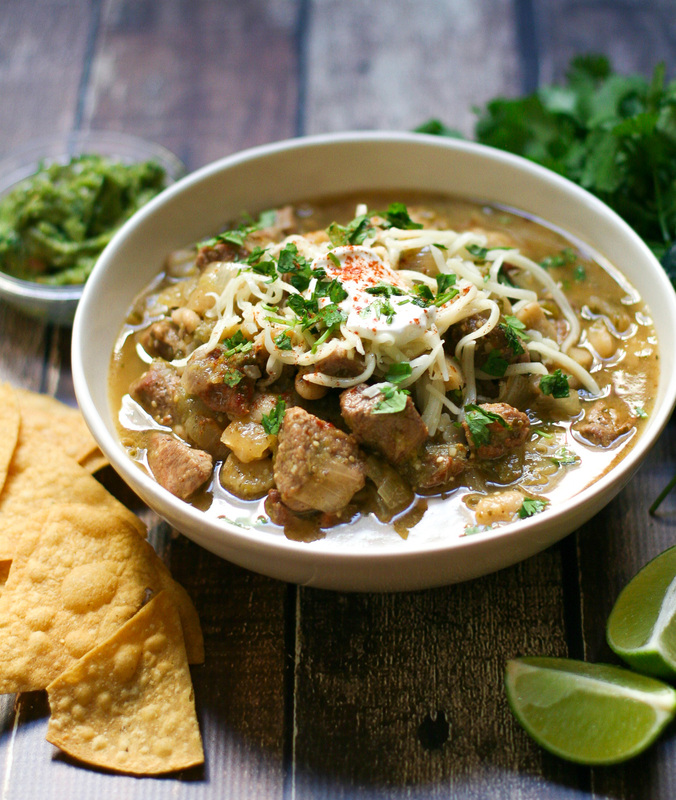 Remove from the heat & serve in deep bowls, sprinkled with cilantro, monterey jack cheese, sour cream, and fresh lime juice. Serve with warm tortillas. 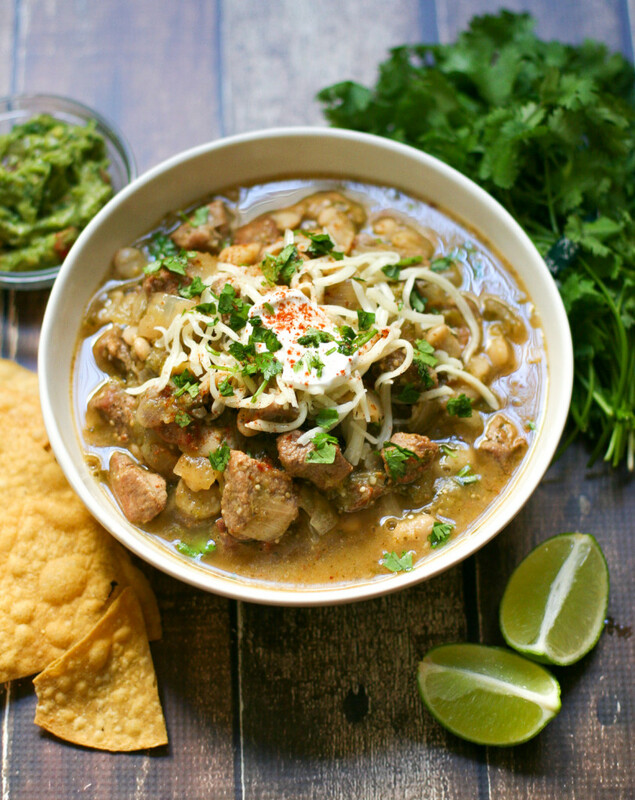 (I like to rip up the tortillas and stir them into the stew.) Enjoy! 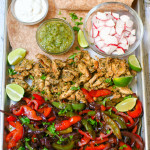 This has me wanting to start #MexicanMonday as a delicious pre-party for #TacoTuesday! This looks so stinkin’ delicious! Lol! I love where your head is at 😉 #mexicanmonday all the way!